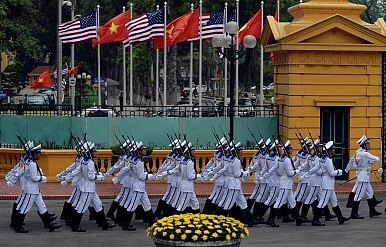 Vietnamese Navy honor guard march to take position prior to a welcoming ceremony for U.S. President Barack Obama at the Presidential Palace in Hanoi, Vietnam May 23, 2016. The highlight of U.S. President Barack Obama’s visit to Vietnam this week was Washington’s decision to finally fully lift a decades-long lethal arms embargo on Hanoi after much speculation (See: “Exclusive: US May Lift Vietnam Arms Embargo for Obama Visit”). But while the move was significant both symbolically and substantively, it is really just the latest in a series of boosts for the U.S.-Vietnam defense relationship across a range of areas over the past few years. And while both sides are optimistic about the future prospects for defense ties, they also admit that there are still major challenges that remain. The foundational elements of a U.S.-Vietnam defense relationship were laid even before the Obama administration came into office, in line with the gradual normalization of relations that had taken place since 1995. During the George W. Bush years for instance, the two countries began conducting regular security and defense dialogues and the United States took some steps to pave the way for growing collaboration, including establishing an International Military Education and Training (IMET) training with Vietnam in 2005 and authorizing the provision of limited defense articles to Vietnam, even though a ban on lethal weapons remained in place. But under Obama, U.S.-Vietnam relations have improved significantly due to a growing convergence of interests in spite of lingering challenges (See: “Why the Lifting of the US Arms Embargo to Vietnam Matters”). As part of its rebalance to the Asia-Pacific, the Obama administration has placed a greater emphasis on deepening ties with emerging partners like Vietnam, which are central to supporting what it calls the “rules-based order” – as evidenced by Hanoi’s involvement in the Trans-Pacific Partnership and its activism on the South China Sea disputes in the face of China’s growing assertiveness. And Vietnam has sought to boost ties with Washington as part of its omni-directional foreign policy to engage a range of major powers to improve Vietnam’s economic development and security. Aggressive Chinese moves like the positioning of an oil rig in Vietnamese waters in 2014 have only helped further catalyze Hanoi’s closer ties with the United States. That broader convergence has led to advances in bilateral defense ties. In 2010, the two countries kicked off a new annual Defense Policy Dialogue (DPD), the second defense dialogue at the vice-ministerial level following the Political, Security, and Defense Dialogue (PSDD) which started in 2008. In 2011, they institutionalized the U.S.-Vietnam defense relationship in a memorandum of understanding on defense cooperation, a defense leg subsequently folded into the overall comprehensive partnership inked in 2013 by Obama and his then-counterpart Truong Tan Sang. Subsequent years have seen some advances in the key areas of the relationship, including collaboration between the two coast guards, the holding of exercises, and even the provision of maritime security assistance to Vietnam, made easier by the partial lifting of the embargo which occurred in October 2014. In July 2015, the two sides also inked a joint vision statement laying out the future direction of the defense relationship, with new areas for cooperation like defense trade and co-production (See: “US, Vietnam Deepen Defense Ties”). “All that would have been hard to imagine 20 years ago,” U.S. Defense Secretary Ashton Carter said in remarks reflecting on the defense relationship following the signing of the Joint Vision Statement last year, which marked the twentieth anniversary of normalization between the two countries. Looking ahead, both sides also say the best is yet to come for the bilateral defense relationship, especially with the full lifting of the embargo, which Vietnam views as a clear sign that ties have been fully normalized. The area that tends to get the overwhelming share of attention is military hardware, especially in in the maritime security domain. The United States has already moved to provide patrol vessels to Vietnam through Foreign Military Financing (FMF), with the goal of enhancing the capacity of its coastal patrol units to deploy rapidly for search and rescue, disaster response, and other activities. When Carter visited Vietnam last year, he also pledged $18 million to help Vietnam buy U.S.-made Metal Shark patrol boats. “We continue to work with the Vietnamese government to identify opportunities to partner together to advance our maritime security goals in the region,” David McKeeby, a spokesperson for the U.S. State Department’s Bureau of Political-Military Affairs, told The Diplomat when asked about the future prospects for U.S. maritime security assistance to Vietnam. No further specifics were provided. With the full lifting of the embargo, The Diplomat understands from officials that sales further down the line could include F-16 fighter aircraft, P-3C Orion maritime patrol aircraft, and other equipment to enhance maritime intelligence surveillance and reconnaissance (ISR) like radar and drones. The key, however, will be which of these transactions would constitute full-price sales rather than transfers made through programs like the U.S. Excess Defense Articles program, indicating used U.S. military items provided to allied and partner countries at reduced or no cost. In any case, U.S. and Vietnamese officials repeatedly point out that big-ticket sales are only one part of a full range of opportunities in the U.S.-Vietnam relationship. One other critical area, for instance, will be capacity-building. Vietnam, a member of the Maritime Security Initiative (MSI) – the Pentagon’s new maritime capacity-building initiative for Southeast Asian states near the South China Sea – is receiving over $2 million in investments including assistance for maritime patrol aircraft and vessel modernization; support for the provision of search and rescue command, control, and communications systems; and training (See: “America’s New Maritime Security Initiative for Southeast Asia”). The Diplomat understands that Vietnam is expected to get a much larger share of MSI funding for next year. “I expect that relationship to continue to deepen,” a U.S. official familiar with the bilateral relationship told The Diplomat when asked about specific MSI programs for Vietnam next year. The official declined to elaborate. Beyond maritime security, we are also likely to see continued U.S. efforts to build Vietnamese capacity in other aspects of security cooperation as well. For instance, through the Global Peace Operations Initiative (GPOI), the United States has been supporting Vietnam’s efforts to build its capacity to contribute to international peacekeeping. In accordance with a memorandum of understanding (MoU) on UN peacekeeping concluded in July last year between the two sides, Washington will continue to assist Hanoi in variety of ways, including through increasing the capacity of individuals and units in training for missions, providing equipment, improving English language competency, and assistance in projects related to the Vietnam Peacekeeping Center, which opened in 2014. Exchanges and exercises could also see a boost. The focus in this realm tends to be on some kind of U.S. access to Cam Ranh Bay, a deep-water harbor in central Vietnam along the South China Sea that Washington had used as a base during the Vietnam War before the then-Soviet Union leased it following the end of the conflict in 1975. During an historic visit to Cam Ranh Bay in 2012, former U.S. Defense Secretary Leon Panetta had said that access for U.S. naval ships to this facility was “a key component” of the U.S.-Vietnam relationship. In March, Vietnam inaugurated an international port facility capable of receiving foreign warships at Cam Ranh Bay, which was followed by vessel visits from Japan, Singapore, and France (See: “Vietnam Unveils New Port Facility for Foreign Warships in Cam Ranh Bay”). The Diplomat understands that the idea of U.S. vessels visiting Cam Ranh Bay is already in the cards and could happen by the end of this year. Beyond this immediate headline though, the key indicator to watch will be the kind of access that Washington is eventually granted. One plan U.S. officials have floated involves port visits to Cam Ranh Bay but as part of a broader naval engagement that would also include a less controversial visit to Da Nang port as well. Washington has also asked to expand the number of port visits that U.S. naval vessels can make to Vietnam each year, which, as with other countries, is limited to just one (the notable exception to this is Russia, which inked a 2014 agreement with Hanoi that merely requires Moscow’s vessels to give prior notice before calling on Cam Ranh Bay). There are also other, bolder proposals being considered in the area of exercises. For instance, in a letter to Trong, the VCP general secretary, ahead of Obama’s visit, Senator John McCain proposed that Vietnam be invited to join the Rim of the Pacific (RIMPAC) exercise, the world’s largest international maritime warfare exercise. But in the realm of exercises too, officials on both sides emphasize the necessity to also look at defense engagements more broadly, since it is the totality of these interactions rather than one headline-grabbing item that ultimately is the foundation for a good military-to-military relationship. U.S.-Vietnam security cooperation in other areas like search and rescue and humanitarian assistance and disaster relief (HADR) have also expanded over the past few years, with firsts occurring periodically that go underreported. On HADR, for instance, just ahead of Obama’s visit to Vietnam this month, the two countries held the first-ever U.S.-Vietnam Disaster Response and Civil-Military Coordination Table Top Exercise (TTX) in Hanoi. Collaboration in these realms is also expected to see an uptick as the years progress. Despite these opportunities, there are still a range of challenges that continue to impose limits on the U.S.-Vietnam defense relationship as well. On the U.S. side, human rights concerns still factor into calculations about how far both sides can advance security ties. While the United States regularly engages Vietnam on the issue in bilateral interactions as well as through an institutionalized human rights dialogue, the presence of an authoritarian regime in Hanoi and the continued abuses that occur in the country make it more difficult for an administration to push the envelope on security ties because of resistance among some actors. The dynamics played out following the lifting of the arms embargo during Obama’s visit this month. In his remarks in Hanoi, Obama argued that the remarkable trajectory of bilateral cooperation had made an across-the-board ban obsolete, and that human rights concerns would still inform any future individual sales to Vietnam despite the lifting. Nonetheless, some lawmakers, activists, and rights groups alleged that Washington had given up a crucial source of leverage on rights without any demonstrable progress from Hanoi. As the United States and Vietnam move closer toward defense sales following the lifting, they can expect continued pushback on these grounds. Meanwhile, in Vietnam, there are still some within the Vietnamese Communist Party (VCP) who remain suspicious of closer ties with the United States, which was engaged in a war in the Southeast Asian country just four decades ago. The fear is that Washington wants to overthrow the socialist government by masterminding a “peaceful evolution” toward the democracy it advocates. This is despite recent steps both sides have taken to break down the barriers to trust, including a visit to Washington by General Secretary of the VCP Nguyen Phu Truong last year – an important signal of U.S. respect for Vietnam’s political regime in spite of legitimate differences. More specifically, on the defense side, even as it engages Washington, Hanoi is still cautious about how it calibrates its relationships with major powers. This is in line with not just its omni-directional foreign policy, but the “3 Nos” that Vietnam has advocated publicly since the end of the Cold War (no to foreign bases on its territory; no to military alliances; no to using a third country to oppose another country). The clearest manifestation of this in the defense realm is Vietnam’s limit on each country’s naval vessels – including those of the United States – to just one port call a year (even though Washington has still managed to send several ships during that single port call). Despite this, as noted above, U.S. defense officials have repeatedly called for an expansion of U.S.-Vietnam naval ties that transcends these traditional limits. Though there could eventually be an increase in the annual number, Vietnam would likely have to be cautious about how it chooses to move towards that change. “We are considering, but that is not easy for us, because what we have now is for other countries too,” one Vietnamese official told The Diplomat. Lastly, the U.S.-Vietnam defense partnership is also a relatively new one, and both sides still have a lot of learning to do about each other. U.S. and Vietnamese officials familiar with the defense relationship maintain that in spite of any lifting, major defense contracts and transfers could take some time because they are contingent on other factors. Vietnam has traditionally relied heavily on Russia for its defense needs dating back to the Cold War days, and any effort to diversify its arms sources would hinge on a variety of financial, strategic, as well as operational considerations. Hanoi will have to make some tough calls as to specifically what kind of new and used U.S. equipment it can afford and what future implications that might have for maintenance, interoperability, and training. And to do so, it will also need to become intimately familiar with dynamics like (admittedly complex) U.S. procurement procedures. Both sides are cognizant of these gaps and have worked to address them. For example, ahead of Obama’s visit to Vietnam, the U.S. embassy in Hanoi and Vietnam’s defense ministry organized a Vietnam-U.S. Defense Industry Promotion Symposium from May 11 to 13 to facilitate understanding between U.S. companies and Vietnamese defense officials. The symposium, which focused on maritime security and awareness this year, featured subjects such as anti-submarine warfare, unmanned aerial systems (UAS), aviation, and cyber security hardware and software. U.S. companies have also been meeting with visiting Vietnamese officials to get a better understanding of the market and how quickly opportunities could be realized. “It’s fair to say the Vietnamese still don’t have a good handle on things, but look, we recognize it’s a process,” a defense industry source who recently met with Vietnamese officials told The Diplomat. So even as media outlets herald the historic lifting of a decades-old U.S. arms embargo on Vietnam this week as a groundbreaking event, the reality is that there is often much more – and sometimes, a little less – to the U.S.-Vietnam defense relationship than might initially appear. In reality, both sides remain focused on the realizable opportunities that lie ahead and are clear-eyed about the challenges therein. Prashanth Parameswaran is Associate Editor at The Diplomat based in Washington, D.C., where he writes mostly on Southeast Asia, Asian security affairs, and U.S. foreign policy in the Asia-Pacific. He is also PhD candidate at the Fletcher School of Law and Diplomacy at Tufts University. Diplomat clarifies what to expect in U.S.-Vietnam defense relations following the lifting of the arms embargo.